The front of the freshened Outlander GT, shown, appears to have been inspired by the Lancer Evolution X. • Small crossover sized to compete with the Kia Soul debuts in Geneva in spring. • 4-seat i-MiEV electric car is due in mid-2011. • 4-seat, 1.3-liter i, a gasoline version of the i-MiEV, is under consideration for U.S.
PALM SPRINGS, Calif. -- Take a look at the front end of the new Mitsubishi Outlander GT, which began reaching showrooms in late November. It symbolizes what's going on inside Mitsubishi these days, as well as what's happening around the industry. Automakers from General Motors Co. to Nissan Motor Co. are adding smaller models as consumers seek better fuel economy. They also have been inching away from products that resemble the big SUVs and vans of the cheap-gas days of the past decade. For its major freshening, the new Outlander GT gets a racy black snout that looks unmistakably like Mitsubishi's hottest product of the moment: the Lancer Evolution X. The Evo X is one of a string of variations for Mitsubishi's Lancer small-car platform. For half a decade, Mitsubishi has struggled with slow-selling products. But company executives think they have struck pay dirt with the current Lancer, which has made a name for itself in rally racing circles. Dealers now sell Lancers that range from entry level -- about $15,000 at retail -- to the MR Touring package of the Evo X for more than $40,000. There are other variations in between. Shin Kurihara, who was responsible for developing the global Lancer strategy, is now CEO of Mitsubishi Motors North America Inc. and is contemplating other ways to capitalize on the Lancer and on smaller vehicles in general. 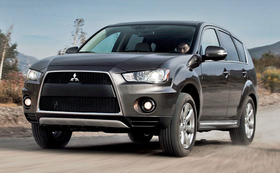 Enter the 2010 Outlander GT. The outgoing generation of the compact crossover has been attracting more customers than Mitsubishi's larger Endeavor crossover, a product the company is not convinced is worth future investment. Kurihara and his team see the writing on the wall. They are assembling a lineup centered on more environmentally friendly cars such as the four-cylinder Lancer and a four-seat electric minicar called the i-MiEV, set to arrive here in about 18 months. A 1.3-liter gasoline version of the minicar called simply the "i" is under study. Mitsubishi plans to reveal an even smaller crossover for U.S. dealers next spring at the Geneva auto show. Giving the current Outlander the Lancer Evo's front-end look, along with more horsepower and more refined handling and interior cues, will help differentiate it from that upcoming crossover, says Michael Evanoff, Mitsubishi product strategy manager. The GT version of the crossover starts at $29,990 including shipping, compared with $21,580 for the base-model Outlander ES. "Moving it upstream will make space for a smaller CUV under it," Evanoff says. "This could mean that some entry trim levels of the Outlander will be eliminated." The GT also has adopted the Lancer Evo's Super-All Wheel Control torque technology. The electronically controlled system shifts power between both front and back wheels and between right and left wheels. Mitsubishi updated the crossover's 3.0-liter V-6 engine, boosting power to 230 hp from 220 hp by improving fuel intake and raising the compression ratio. The company says the engine changes produce lower carbon dioxide emissions. "This is the larger objective for Mitsubishi," Evanoff says. "We're trying to put more into small packages."